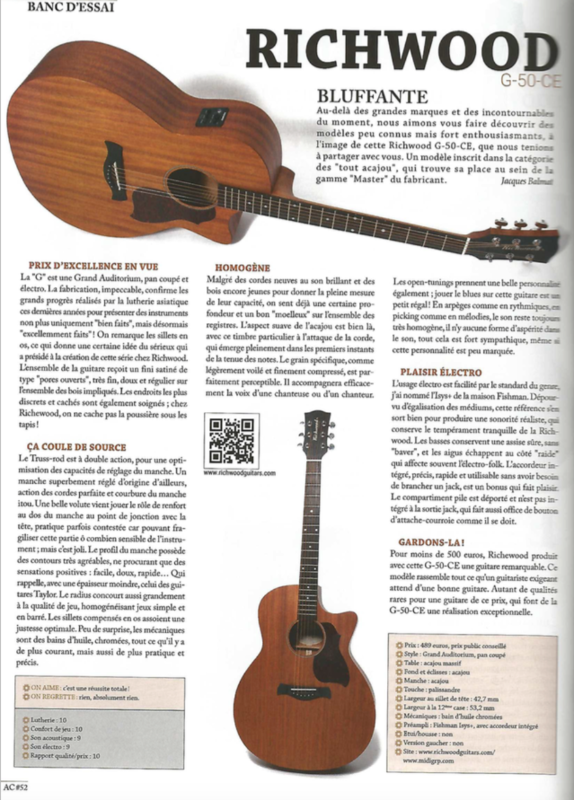 Thank you Guitarist Acoustic for featuring our brand and our wonderful guitar. Of course we couldn't agree more. Click 'Read More' to find a link to the article, as well as the English translation! Besides all the great brands and must sees of the moment, we like to let you discover exciting unknown models like this Richwood G-50-CE. This model is a “All mahogany” placed in the master series of the brand. The “G” is a Grand Auditorium with cut away and electronics. The impeccable construction confirms the huge steps forward made by the oriental lutherie in the past years to present not just “well-made” instruments but “excellently made” instruments! We notice the bone topnut and bridge which give some idea of the serious input which was given during the creation of this serie at Richwood. The guitar has an open pore satin finish, very thin, smooth and regular on all the woods used. Even the hidden corners are nicely finished; At Richwood, we do not hid dust under the carpets! The Truss-rod is double actioned in order to optimize the possibilities of neck adjustments. The neck is actually, out of the box, well setup, The action is perfect and the rounding of the neck as well. A beautiful volute comes to strengthen the back of the neck at the junction of the headstock, a use sometime contested as it could weaken this sensitive part of the instrument; but it’s nice. The neck profile has a very pleasant rounding which procures only positive sensations: easy, smooth, quick… which reminds, with a lower thickness the Taylor guitars. The radius helps the playability a lot on both regular playing and “barré”-style playing. The compensated bridge and topnut in bone allow an optimal tuning. No surprise, the machine heads are in oil bath, chromed, very common but also very practical and precise. Despite the bright new strings and the young wood is still too young to give their maximum, we can already feel a certain depth and nice “mellow feeling” on the total of the registers. The sweet aspect of the mahogany is also present with its particular timbre which comes with the attack of the strings emerging immediately when holding the notes. The specific sound type, slightly veiled and finely compressed is absolutely noticeable. It will be a perfect addition to the voice of a singer. The open tuning has a nice personality as well; to play blues on this guitar is a true delight! Whether you play arpeggios, rhythmical, finger picking or melodies, the sound always remains very consistent, there is no sign of roughness in the sound which is seriously pleasant, even if it’s personality is not so marked. The amplified use is simplified by a standard Isys+ by Fishman. Without equalizer, this model is doing fine producing a realistic sound conserving the quiet temper of the Richwood. The basses stay firm without saturating and the trebles do not suffer from the hard sound often arming the folk acoustic. The integrated tuner, precise, quick and can be used without plugging the jack which is a nice bonus. The battery compartment is accessible from the outside, the jack output is integrated in the strap holder button as it should. For less than €500, Richwood makes an incredible guitar with this G-50-CE. This model meets all the requirements a demanding musician would expect from a good guitar. Many rare qualities for a guitar of this price which make the G-50-CE an exceptional instrument.